Cantilever gates deliver a great solution when used in conjunction with a security gate or automated security gate. A cantilever is basically a beam supported only on one end. In cantilever gates the rails are on the fence structure hidden out of view. The great advantage with cantilever sliding gates is there is no track. This means that the gate slides smoothly and quietly. They are perfect in situations where there is uneven ground, over pavers, grass, gravel or water. The operation of a cantilever gate is smooth and quiet as there is no contact between the gate and the track that you would normally have to use. Cantilever gates are great for extra wide spaces or extra wide driveways. For exceptionally wide areas it is possible to use a cantilever gate from each side of the driveway, meeting in the middle. Another great benefit of cantilever gates is that they can work on an incline and they are great for steep driveways. The reason is they can be installed on an angle. Cantilever gates are available in a range of styles and colours. 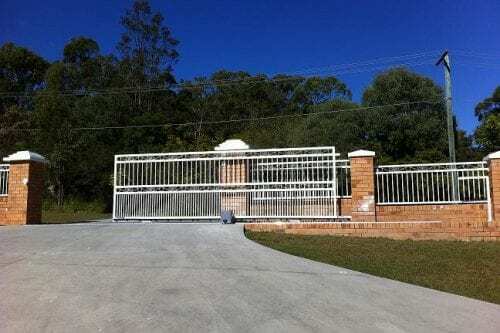 It is possible to have cantilever gates custom made to suit any style or design you can imagine. Sometimes home owners don’t know what to ask for. They just know they want an automated security gate that is quiet and delivers a great solution for their space. A reputable fabricator will advise you on the range of gate solutions available to you and will be able to design the right solution for you. Cantilever gates are available pre produced or can be custom made to suit any situation. Usually the cantilever gate design will be custom to suit either the specific need of the space or the aesthetics of the design. Cantilever gates are great in all weather conditions because they do not come into contact with the ground. Even weather conditions such as snow or ice have little effect. Traditionally cantilever gates have been used mostly in commercial situations as they are ideal for large spaces and high traffic areas. More recently homeowners have become aware of the benefits of cantilever gates and are using cantilever gates in residential situations. Installation of cantilever gates tends to be easier than more conventional methods as the use of a track is not required. There is no need to dig up an existing road or driveway saving time and money. If you have an upcoming building project and you are thinking about gates, then it is definitely worth considering a cantilever gate. Cantilever gates really do deliver a great solution.